Are you getting married this year? There are a lot of little lovelies in Jamie's shop, Hev-Vin Designs, for you to check out. 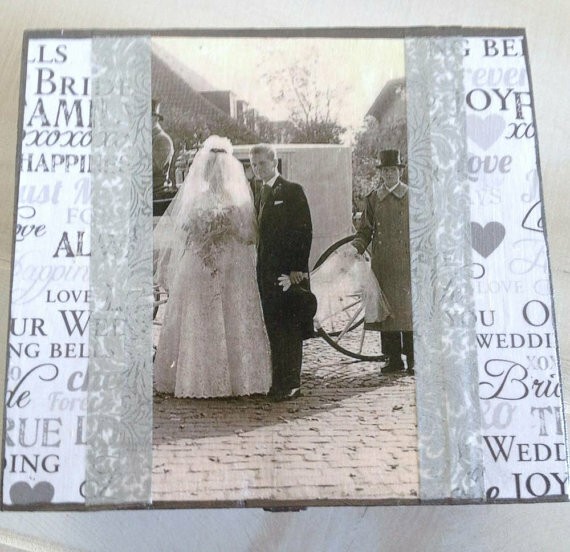 She offers a variety items from wedding boxes, clutches, banners, and more. 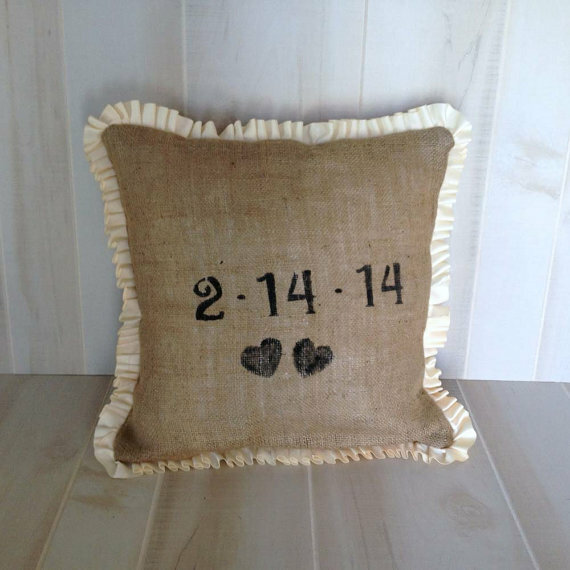 If you like rustic, you are going to fall in love with her product. Jamie began selling her tote bags at a location called, Jennifer's Beads. One day one of the shop owners mentioned "Etsy" to her. They thought it might be a good fit for her items, and suggested she check it out. She has been selling on that venue since 2007. Being a mother and wife, she feels it is important to be a community volunteer. She loves to connect with creative types, helping to promote small businesses. Growing up, her dad was a small business owner, so she knows the importance of keeping a support system in place, buying local and handmade as often as she can. 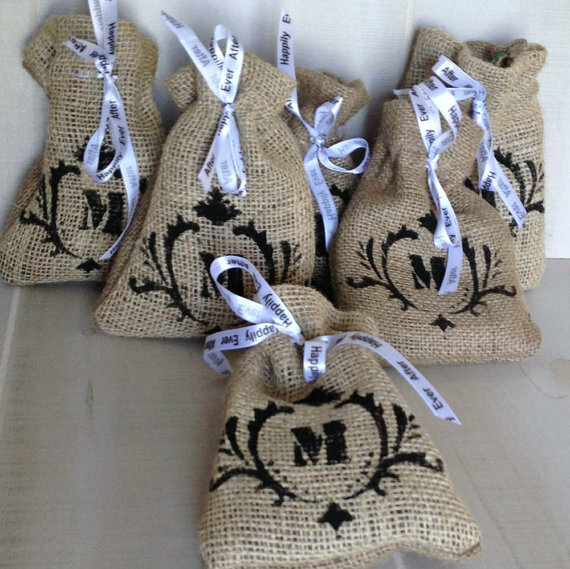 These cute little burlap bags make wonderful favor gifts for the guests who attend your wedding. Many of Jamie's items also are awesome gifts for bridal showers, or even for your bridal party. Give the gift of something unique. Jamie's passion is sewing. 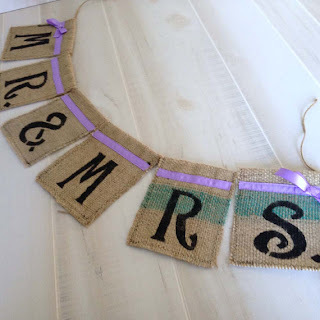 She sells custom and ready made clutches, bunting banners, wreaths, favor bags, wine bags, pillow shames, bridal hair accessories, and artisan keepsake wedding card boxes. 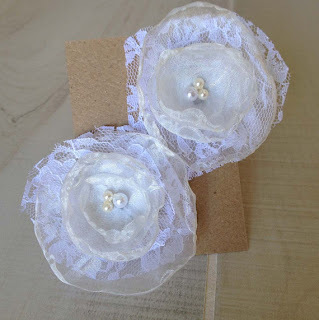 She designs her own items and they are created from sustainable materials. Enjoying drafting her visions on paper and creating a beautiful product, with fine details and unique textiles, is truly a fun part of her passion for sewing. She often dreams about designs in her sleep, sketching her ideas on paper until she is able to get in to her studio. What a great way to remember your ideas. Discounts are offered for multiple purchases such as bridesmaids' accessories or table toppings for wedding receptions. 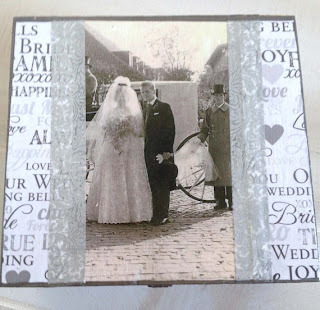 She also offers wholesale pricing for wedding planners and local businesses, adjusting for large quantity orders. What a wonderful addition her items would be to any wedding. When selling products online, Jamie feels great customer service is very important. Responding to customers emails in a timely manner and fast shipping are key. You will reap benefits when you participate in cross promoting for each other, so join a team who focuses on this, like Etsy Team Columbus. Do what you are passionate about, and it will show in the products you create. Jamie's hobbies are many. She enjoys blogging, thrifting, crafting, collecting vintage clothing, craft fair volunteering and managing, as well as visiting art galleries and art events. This of course is in addition to spending time with her family. Inspirations for Jamie's work are the strong work ethics she sees in others, her dad's patience and ability to really listen, and her daughter's tenacity. This really shows in the quality of the items she creates. Her favorite quote: "Follow your bliss and the universe will open doors where there were once only walls", Joseph Campbell. 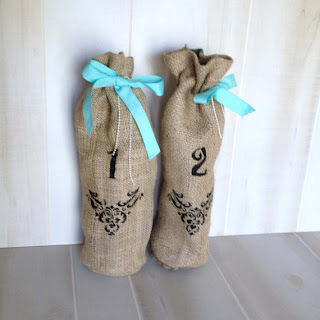 To visit all of Jamie's lovelies in her shop, please click here: Hev-Vin Designs .